By filling your water softener regularly with water softener salt, you will increase its effectiveness and keep it in working order. Solar salt plays an important role in maintaining spotless dishes, and it also protects your plumbing from harmful scale buildup. You can stock up on this necessary item with our large bags, ensuring that you always have some solar salt on hand when you need it. 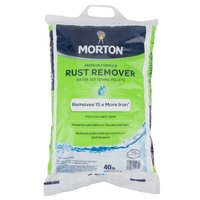 Also make sure to check out other great items from Morton. Solar salt works with your water softener to reduce calcium and magnesium that is present in hard water. By keeping your salt fresh, you can reduce the mineral buildup on your products, making for cleaner dishes and softer laundry. Using water softener salt also allows you to use fewer cleaning chemicals, as you will not need to cut through scale buildup as well as dirt and grease when you’re cleaning. For other helpful cleaning products, check out our laundry products for dispenser fed machines, laundry products for manually fed machines, and dish and flatware racks. 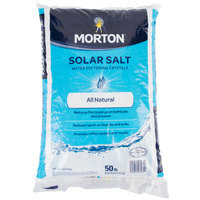 If you're wondering where to buy morton water softener solar salt, we have a large selection of morton water softener solar salt for sale at the lowest prices.